Little, Brown Books for Young Readers, 9780316306423, 1632pp. The perfect gift for readers who want to be swept away. 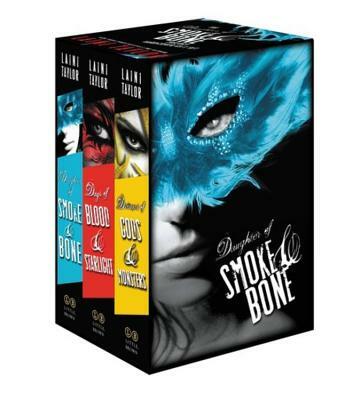 The Daughter of Smoke & Bone Trilogy Gift Set includes three paperbacks: Daughter of Smoke & Bone, Days of Blood & Starlight, and Dreams of Gods & Monsters. From master storyteller and National Book Award finalist Laini Taylor comes a sweeping and gorgeously written modern fantasy series about a forbidden love, an ancient and epic battle, and hope for a world remade. Laini Taylor is the New York Times bestselling author of The Daughter of Smoke & Bone Trilogy, The Dreamdark books Blackbringer and Silksinger, and the National Book Award finalist Lips Touch: Three Times. She lives in Portland, Oregon with her husband, illustrator Jim Di Bartolo, and their daughter, Clementine.